Treatment of Cystic Acne: Is There A Cystic Acne Treatment That WORKS? Cystic acne is a severe form of acne that develops into cysts. They are basically inflammatory nodules. Though it is not rare but it is not as common as acne vulgaris. Cystic acne can be very large in size and can cause lots of pain. These are filled with pus like substance and occur in on the face, shoulder, chest and back areas. A common treatment of cystic acne is Isotretinoin. Isotretinoin is a very common medication for cystic acne and it needs to be taken orally. Taking it regularly for at least 16 to 20 weeks can help you get rid of your acne. But the problem is that the acne will come back after some time, hence it is not a permanent cure. Also treatment of cystic acne through Isotretinoin can lead to lots of side effects as well. Isotretinoin is a very expensive drug and can cause lots of side effects. It can lead to the swelling of the lips and the eyes. It also cause severe itching , dryness of the mouth and over all skin, bleeding from the nose, muscle pains, inability to see properly at night, increased levels of cholesterol etc. It causes some serious side effects. But the most serious side effect caused by this drug is that it can cause birth defects, i.e. if you are carrying then your baby might be born with defects due to this medication. You should never take this drug if you are pregnant. You should also make sure that you don't get pregnant while you are on this drug. Though treatment of cystic acne through Isotretinoin might yield results but do you really want to undergo so many side effects in order to cure your acne. And more so when it is not even a complete and permanent solution and when it is possible to cure acne through other treatments that too without any side effects. Let us first understand what causes cystic acne. Toxic Buildup in the body. The genetic sensitivity of sebum glands towards the hormonal imbalance. You can cure your cystic acne only taking into account all three factors. Since it is not possible to do anything about the genetic tendency you have to take care of the other two factors. 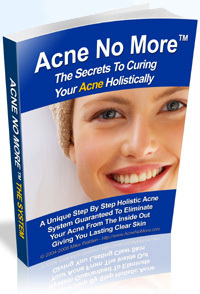 The best Treatment of cystic acne is the holistic approach. The conventional methods only address the symptoms thus fail to eliminate the root cause of acne. Whereas the holistic method takes care of the underlying root causes of the acne mentioned above and eliminate them completely. The holistic approach is also devoid of any kind of side effects. Adopt the holistic approach and gift yourself the blemish free clear skin you always dreamt of.